My first idea for this theme was family gatherings. I thought about many other interpretations but kept coming back to the original. Our family is scattered across the UK and we rarely all get together so events like weddings are very special. 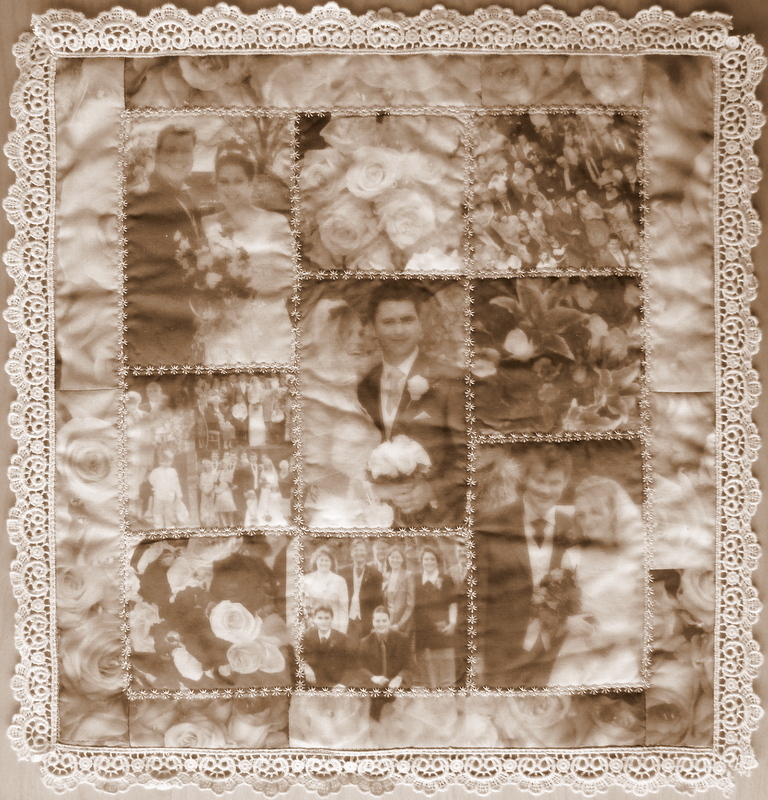 I decided to use photos from my 3 children’s weddings – brides, grooms, guests and flowers – and to unify them with a sepia colour scheme. I added a soft focus filter to give all the pictures an extra gentleness and then printed them on tea-dyed cotton. The pictures were cut and assembled simply so that the events and people remain the focus of the piece. I also made sure that all members of our close family are included somewhere. Machine embroidered flowers and a lace border complete this reminder of family gatherings to celebrate 3 wonderful wedding days. I really love this quilt. It’s so precious! Love the softness of this quilt. You did a wonderful job! Delightful. What a lovely reminder of happy family gatherings!